Triumphant return to the Fringe for one week only. 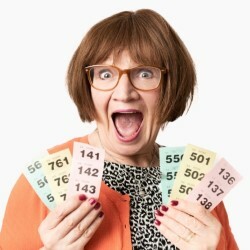 Barbara Nice brings her touring show, Raffle, to this year’s Fringe. Star of her own BBC Radio 2 sitcom, Barbara Nice is at the top of her game. Described as being a woman with a direct line all the way back to Marie Lloyd, a Barbara Nice show is guaranteed to get you laughing and come out of the show feeling better than when you came in. ‘I can’t remember when I last felt like dancing home’ ***** (Chortle.co.uk on Hiya and Higher). **** (TheatreBath.co.uk).